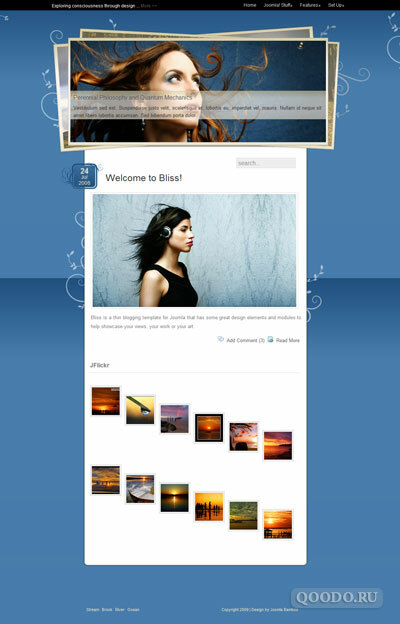 JB Bliss - bright template for Joomla from the studio JoomlaBamboo with stunning style. Template JB Bliss - a great option to create a creative website or blog to Joomla. Template JB Bliss has JQuery and Suckerfish menu, preset module Bamboo-slideshow module for commenting materials JSomments, 7 wonderful styles and 12 module positions. JB Bliss template file contains PSD-sources. Template JB Bliss is set to sites running Joomla 1.5.